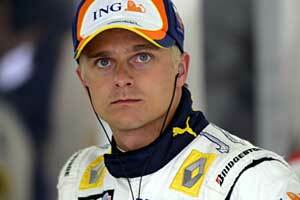 Kovalainen was interested in racing from a young age as his father competed in ice races. He drove his first kart at the age of six and began competing as soon as he was allowed a licence at 10. He continued to race successfully in karts the end of 2000 when he won the Elf Masters kart event in Paris and decided to move into Formula Renault in Britain with the Fortec team and won two races and finished fourth in the series at his first attempt. He was signed up as a Renault Development Driver and in 2002 moved up to British Formula 3 with Fortec. He won five races and finished third in the championship behind Robbie Kerr and James Courtney. He moved on to the Nissan World Series in 2003 with the Gabord team but it was his team mate Franck Montagny who dominated winning nine times to Kovalainen's single victory. That autumn he had his first test in a Renault F1 car and later tested a Minardi before Renault decided to sign him up as a test driver. In 2004 he stayed on in the Nissan World Series - switching to Pons Racing - and won the title with six victories. At the end of that year he found himself in the international spotlight when he won the Race of Champions in Paris, beating David Coulthard, Jean Alesi, Michael Schumacher and World Rally Champion Sebastien Loeb one after another. In 2005 he raced in the GP2 Series and led the championship before being overtaken in the final races by Nico Rosberg. Heikki was then promoted to be the Renault F1 test driver and was named as Fernando Alonso's replacement at Renault in September 2006. Kovalainen's first year in F1 was uneven, marked by many achievements but some erratic moments. He scored his first Championship point in his second race, and his first F1 podium finish with second in Japan, but made some unforced errors in both qualifying and racing. However, he was more than a match for his very experienced teammate Giancarlo Fisichella, finishing ahead of him in 11 races, including eight consecutively in the second half of the season. It was an impressive performance overall, which led McLaren to take him on for 2008 to partner Lewis Hamilton after Fernando Alonso left to return to Renault.